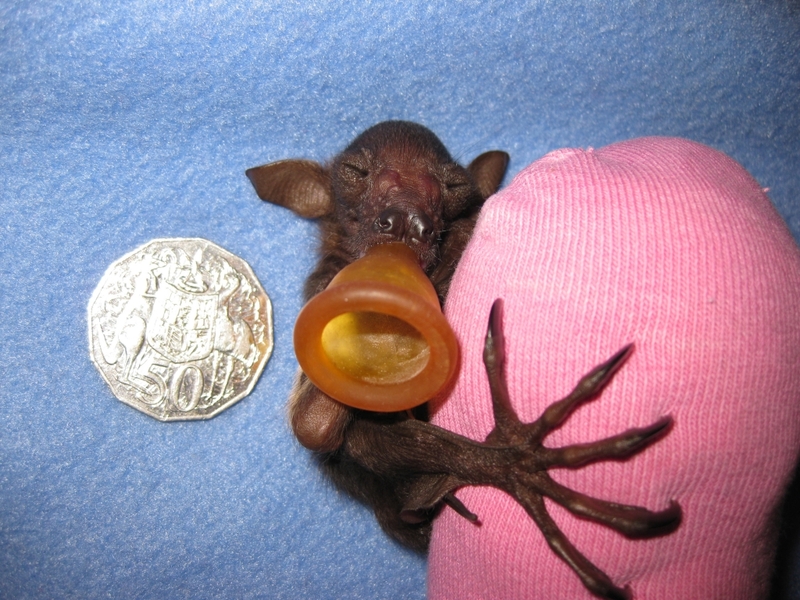 Little Red flying foxes do not usually give birth on the Atherton Tablelands and so we rarely have them come into care in great numbers. Most years we have a few, coming in from the surrounding areas where the winters are much warmer. We find them as easy to rear as the Spectacled flying foxes and use the same milk powders. Releasing them is more difficult as there is not always a colony of Little Reds nearby and so it is difficult to give them a soft release program. There have been starvation events in recent years where significant numbers of young are found dead under the camp. We think that food shortages mean the mothers do not have enough milk and have to abandon their young. This species almost entirely feeds on nectar and so is very dependent on climatic conditions that determine flowering and nectar production. Mast flowering events, especially of eucalypts, attract huge numbers of Little Reds. These events are characterised by a massive flowering every 7 or so years resulting in enough nectar to attract huge numbers of Little Reds into the area. They provide a massive pollination service that ensures a massive amount of fruit/seed is set. This ensures survival of a large proportion of the seed, exceeding what the predators can eat. These plants rely on the Little Reds for the survival of their species.